Our book reviewer, Sheila Welch, has recommendations on books to read about adoption in recognition of National Adoption Month. 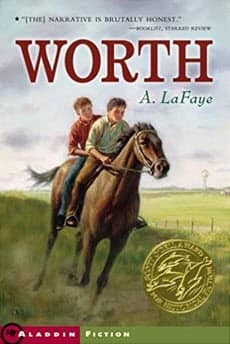 I read Worth by A. LaFaye over a year ago, but I have not forgotten those two strong boy characters. All the main characters are clearly defined and play important roles in this captivating winner of a Scott O’Dell Award for historical fiction. When Nathan, the narrator, is severely injured on his family’s Midwestern farm, his father brings home a boy who arrived on a train. Is this city kid going to replace Nathan? This question will grab and hold the interest of readers in grades fourth through eighth. Worth brings to life a period in the history of the USA that's unfamiliar to many children and even adults. From 1854 until 1930, Orphan Trains carried destitute city kids west to be placed with country families. Neither Nathan nor John Worth is happy about their drastically changed lives and their inability to turn back time. Yet gradually they begin to inch forward together, learning about and from each other. When a local range war flares up, the two boys cooperate to help curb the hostility, and readers will welcome the realistic but satisfying conclusion. The Aladdin paperback edition has an appealing cover and contains thought-provoking questions for classroom or book club discussion. 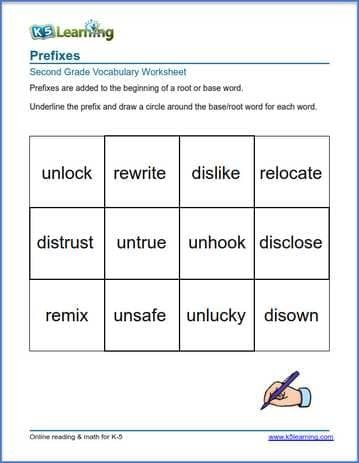 We’ve added new vocabulary worksheets to our grade 2 and grade 3 sections focusing on affixes (prefixes and suffixes), non-literal meanings of words (idioms and similes) and shades of meanings of similar words. Students work on deciphering prefixes and root words. We found some gaps in our vocabulary worksheets pages and have started to fill them. We've just completed the grade 1 worksheets and over the next few weeks you'll see further sections added to grade 2 to 5. Students work on how to sort words into categories. We've also added two new sections: suffixes, and root words and word endings. In grades 5 and 6, students learn how to multiply and divide fractions. Below we are going to tackle dividing a fraction by a fraction. It can be tricky to learn, but with some simple rules to follow, students can master these equations. In dividing fractions you take the reciprocal (invert the fraction) of the divisor and multiply the dividend. We know how critical spelling is for elementary students to develop their language skills. Many of you search our spelling pages for free worksheets to help complement your children’s spelling needs. However, our worksheet section needed some improvements in navigation to help you find the worksheets you want more easily. We’ve spent some time doing just that and here’s the result. As your kids develop their mathematical skills, the will start to discover the rules that guide computation and problem solving. Rules in math are based on patterns. 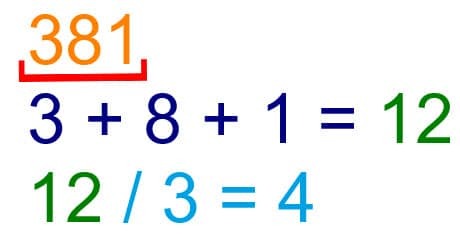 Students learn to recognize these patterns in different math situations as well as the rules connected to these pattern. Today, we are going to take a look at divisibility rules. Divisibility rules are a quick way of working out if a number is divisible by a fixed number without performing the division. This is usually done by examining that number’s digits. The best way to explain this is to jump right in. We are going to show you the divisibility rules for the fixed numbers 1 to 9. This one is easy: every number is divisible by 1. The unit digit is 0 so 1,240 is divisible by 2. The sum of the digits is 12. 12 divided by 3 is 4, so 381 is divisible by 3. 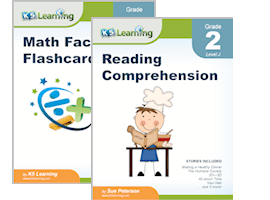 A while ago we told you about the updates and new worksheets we added to our Kindergarten reading section. 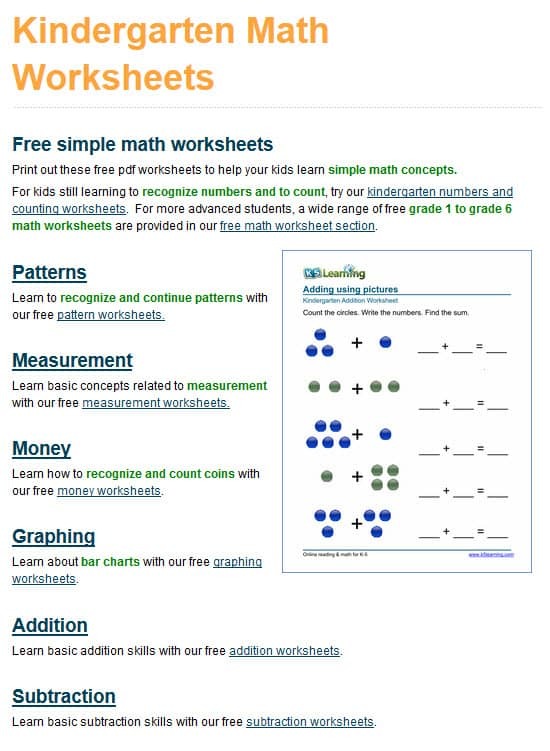 We have now completed similar updates and added more worksheets to our Kindergarten simple math and other activities sections. Let’s give you a tour. Now that the kids are getting back to school, teachers and parents may be looking for fun new ways to engage kids in reading in the classroom or on play dates. How about trying out a short play? We’ve added two new workbooks of plays to our bookstore to help you get yourselves organized. 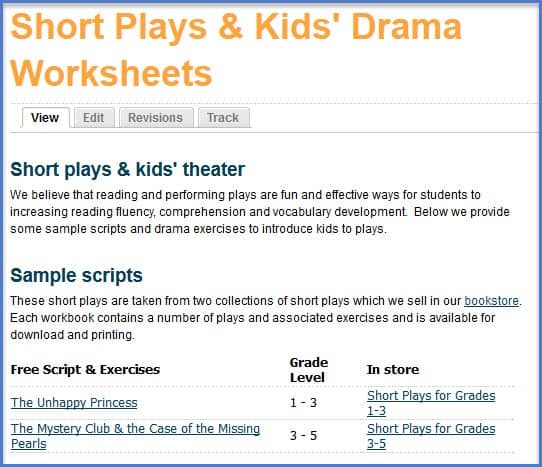 To test out the plays, we have added two sample plays to our free worksheet section. 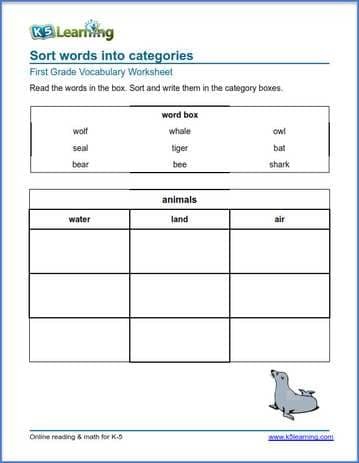 We have expanded our grade 1 vocabulary worksheets page with two new sections. These two sections include worksheets on practicing matching and writing words to pictures, context clues, and filling in missing words in sentences. We’re also in the process of writing a vocabulary 1 workbook, which will be published to our bookstore shortly. 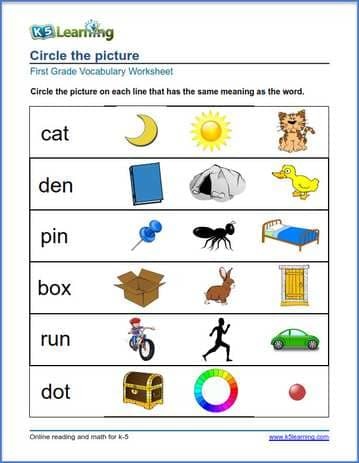 The student needs to circle the picture that matches the word on each line. Cursive writing is tough for younger students. Once your child has learned how to write individual cursive letters, it’s hard to move straight onto writing entire cursive words. So we’ve added a new section – a middle step, so to say - that helps students grasp how to join two individual letters. We’ve created a page of the most common letter joins with individual worksheets for each. Joining cursive letters at the bottom, such as ch or kn.